The 2017 Epcot Food and Wine Festival opened yesterday and if you’re making plans to attend you’ll want to check out the new Disney Gift Card designs for the Festival. There are three mini gift card featuring Remy putting the finishing touches on the Festival The designs of the cards feature food art inspired by England, France, and Italy. These mini cards come with a wristband for easy access when you want to pay for food, merchandise, and more. The gift cards can be activated with as little as $15 and can be reloaded even after your Festival visit ends. Guests can also purchase the special limited-release $200 gift card that comes with a lanyard, medallion, and carrying sleeve. This gift card can also be used for food, beverages, merchandise, and more at Disney World. And you can reload it after the Festival ends. 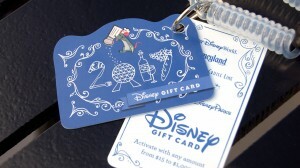 The Festival gift cards are available at Epcot and at Epcot-area resort hotels throughout the Festival.